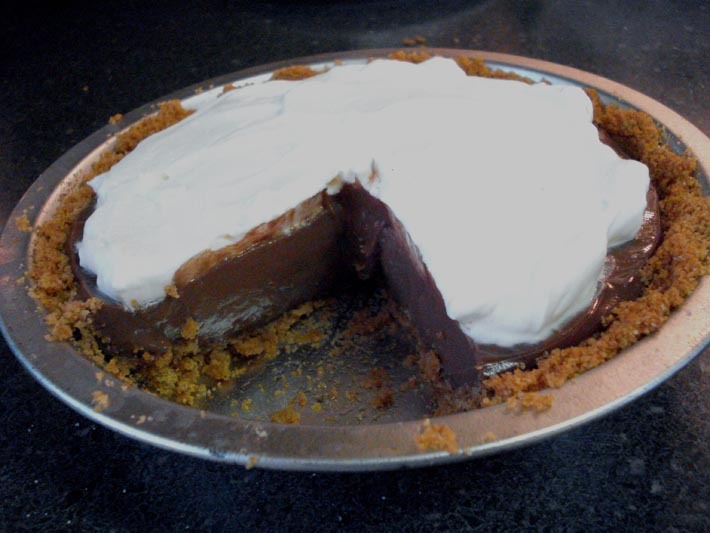 Chocolate cream pie recipe for two, made in a mini 6″ pie pan. Scroll down for a chance to win a mini pie pan! Don’t miss the how to video to the right! I don’t get to say THANK YOU enough around here. And before you write this off as some blanket ‘thanks for visiting my site’ letter, please, sit and stay awhile. While I am grateful you are here, there were a lot of people here before you. Mainly, my grandma. She small-batch baked. She was forever cutting recipes in half because it was just her & my grandpa. Even when my Mom was in the house, she made small batch recipes because 3 people don’t need 3 dozen cookies. This small batch dessert thing is in my blood. This mini 6” pie plate pictured in these photos belonged to my grandma. My mom grew up in the 1950s; I want you to know that someone else was small-batch baking and buying mini pie plates even back then. So, while it seems like a mini pie plate is something kitchsy found in a hobby store, I’m here to tell you that it’s been around for a while. I was a single grad student when I created this site. I started it because I was scaling down my mom’s dessert recipes while living far away from home in California. The first recipe I ever scaled down was her Texas Chocolate Sheet Cake into 2 oversized ramekins. They’re 10-ounce ramekins, and I don’t even know how they found their way into my kitchen. I certainly didn’t purchase them with the intent of ‘blogging’ about it and taking pictures. They just appeared in my kitchen. It took me 3 tries to scale the recipe down. I ate the first successful attempt while reading The Pioneer Woman’s blog on my green IKEA couch, and thought, “Hey, I wanna share recipes too! Maybe someone else out there wants a small cake instead of a big one”. It was very humble in the beginning. It was honest, pure, and from the heart. And, I don’t exactly know what happened, but this site here brings me a lot of heartache. Whether it’s the nature of owning your own business or the comparison trap, this site floods and haunts my brain all at once. Sometimes I need a big glass of wine and a benedryl to get some relief. Sleep is the only relief because spending time doing something else besides working is ineffective because of guilt. I can take my kid to the playground but if mentally, I feel like I need to be working, it’s not the same. I do want to be working. I want to be here. I’m good at scaling down recipes and it is a true source of joy for me. When I make a giant recipe for cookies or a big 3-layer cake, it makes me angry. I hate having to scoop the cookie dough so much, in and out of the fridge, washing the baking sheet between batches (because a hot pan makes cookies spread too much while baking, you know). And while I do like making big cakes on occasion, the amount of ingredients astound me. Three cups of flour is a mountain to me. It doesn’t feel right in my hands. I can’t even count that high when I’m baking; I have to count out loud and even then, I mess up frequently. Anyway, I’m here to say thank you to my grandma for instilling in me the love of small-batch baking. Though I don’t remember her doing it much as a kid, I know she’s the source of all things. I don’t talk about it much (and I have no idea why), but my grandma and her sister ran a very famous restaurant in Dallas. When my mom was little, Rose’s Bluebonnet Sandwich shop was the place where all downtown Dallas workers stopped by for a plate lunch. Rose got up early and flipped the barbecue in the smokers; her arms and hands were black from the smoke. When Bonnie & Clyde was being filmed in Dallas, she was tasked to feed the crew during filming. Rose fed people well. And my grandma helped her during her entire life. My grandma helped her fend off the celebrities and press that wanted to sing her praises of the best hamburgers ever, because the two of them really couldn’t handle any more business. I remember my grandma counting tickets at the end of each day, and I think 75-120 burgers was the usual amount. When D Magazine would write about her, the two of them would groan and complain as the line formed out the door. When Don Henley (Dallas resident!) dedicated a song to her burgers at a concert my parents attended, we laughed because we knew Rose was gonna be pissed. We called her restaurant Rosie’s, never Bluebonnet, and none of us has ever had a better burger anywhere. Rose passed when I was in college. I didn’t quite know that the the summers I spent working in her restaurant would mean anything to me later in life. I only knew that all of the adults around me talked frequently about how she should retire and take a break from feeding and serving people. She’d been doing it ‘too long,’ in their opinion. But she didn’t. When she called for an ambulance on a Friday afternoon (after lunch service and cleaning up the kitchen), she knew if she went to the hospital, she wouldn’t be coming home. She was right. The thing is, 2018 isn’t shaping up to be the year I wanted it to be, so I’m here to deal with it. To face where I come from, why I do what I do, and what I want out of it. But really, we can’t ask for the things we want so directly in life: We can ask for a job, but we cannot ask for the amount of money we want with it. We can ask for a certain type of life partner, but we cannot ask for the way they will change us and force us to face the bad parts of ourselves. We can ask for a baby, but we cannot ask for the skills to raise that baby perfectly. I can’t ask for anything. All I can do is what I want to do…what makes my blood pump in the morning, even though there are ugly sides to it. This is the very first recipe I posted on my site in 2010. Even though the first recipe I ever scaled down was Texas Chocolate Sheet Cake, I chose to share this recipe first as a way to honor to my grandparents. Here’s the old photo from 2010! Yikes! I wrote exactly 46 words about why I chose to make it, including a few lines about why you should make it too—like I was so certain anyone was reading and that I could convince people to do things in their kitchens. (I chose this recipe to share first because it was my grandpa’s favorite pie that his step-sister Stacey made for him. He served in Pearl Harbor. He was a medic in the Army who very much wanted to go to medical school but the stock market crash had something to do with his cotton farmer daddy not having enough money to send his kids to college. His daddy had two families because my grandpa’s mom passed away early in life and he remarried. When my grandpa came home from the war, Stacey made him this chocolate pie. He ate the whole pie in one sitting. He said the food was awful in the Army, as I imagine most farmer’s kids found out when they served). Much like I can’t understand now why 2018 is going the way it’s going, I couldn’t predict how much this choice of first recipe to share would give me a foundation today. A place to start over in 2018. A place to draw the line and figure out how I feel and how much I’ll let other people affect that. I took new photos and we made a quick video (it’s at the top of the post)…because I’m still in the business of trying to convince you to do things in the kitchen. I actually updated the recipe too, because the original recipe had a pudding filling that was too much like pudding. It was delicious, but this is 2018 where food photos count, and pies must hold together in one pretty piece, or else! Only sort of joking, we added an egg yolk and an extra tablespoon of cornstarch. 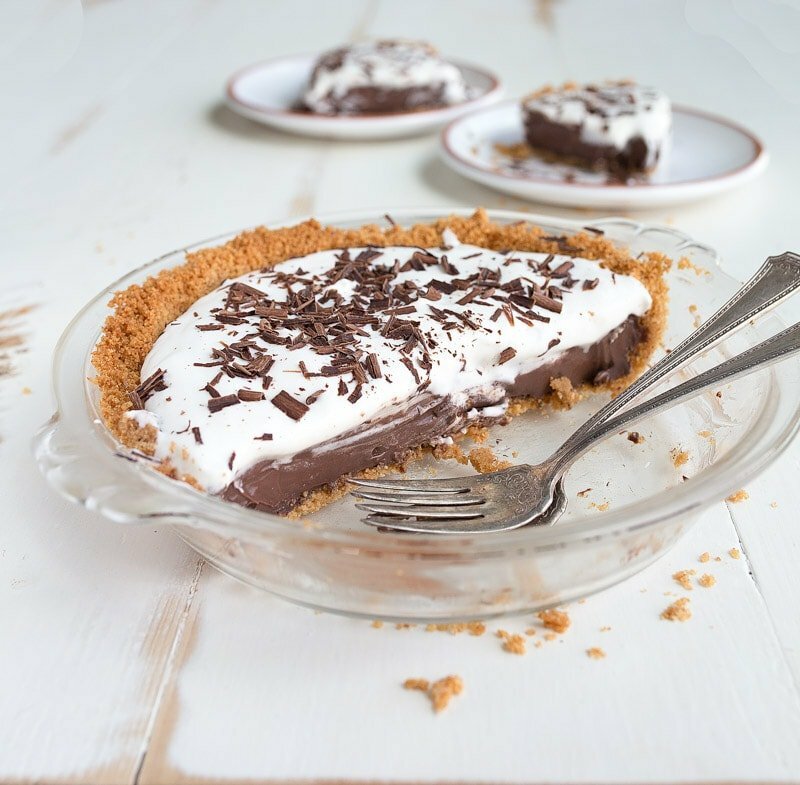 It’s still the best chocolate pie recipe I’ve ever had. There are still remnants of Rose in Dallas. I’ve just moved back here after 12 years away, and I’ve never felt more comfortable in my own skin in this town. I love Texas. It’s an identity for me. There’s a restaurant in Dallas called Mesero that has a burger dedicated to her (The Rose Burger). My parents found it by accident while eating there, and listened to the owner describe his love for Rose and her food. She was a beacon. And she did it all with her sister (my grandma). And neither of them are here anymore to help me out of this mess I’m in now. But as strong women, they would tell me that women don’t really need help, we just need time to figure things out. I’ve been told that I cook like Rose. I’m a mess in the kitchen. I just throw things together and somehow, it works. I cook with a lot of confidence–I generally know what I’m doing in the kitchen and how it will turn out. I’m not afraid to fail, because I’m confident that even my failure will be passable. I’m the person that makes new recipes for company. The stress and anxiety it causes is never worth it, but I do it anyway. Thank you for being here. Truly. I hope you enjoy the recipe video with this post. Let me know if you have any questions; I’m here to help. Also, I’m currently hosting a giveaway on instagram to win a 6″ mini pie pan. I really want you to make this recipe, and I’m concerned you don’t have a mini pie pan. Head over here to enter! Makes 1 small 6" pie. First, preheat the oven to 350. Pulse the graham crackers, melted butter, cinnamon and sugar in a food processor. Alternatively, you can crush them in a plastic storage bag. Make sure the crumbs are very fine. Press the mixture into the pie tin, using the bottom of a glass or small measuring cup to pack the crumbs firmly. Press the crust up the edges of the pie tin. Bake on a cookie sheet for 10 minutes. Let cool while you make the chocolate filling. Sift the sugar, cocoa powder and corn starch into a small bowl. Add 1/2 cup of the milk and whisk vigorously until the mixture is very smooth and free of lumps. Slowly add the rest of the milk while whisking constantly. Finally, whisk in the egg yolk. Pour the mixture into a small pan and bring to a simmer over medium heat. Stir the mixture constantly with a wooden spoon, being sure to scrape the corners of the pan with the spoon. Once the mixture starts to thicken and simmer, turn the heat to low and continue cooking for 1 minute. The mixture should be silky and slightly thickened—it will firm up in the crust later. Remove the pan from the heat and add the butter. Stir to melt, then stir in the vanilla. Pour the pudding into the crust. Press plastic wrap against the surface of the pudding and chill in the fridge for at least 4 hours or overnight. When ready to serve, whip the heavy cream, sugar, and vanilla together until a thick whipped cream forms. Spread evenly on top of pie. Slice and serve. Great idea – desserts for two. Can I be you taste-tester? Good Luck! Hope you can get out of the messy, also loving hearing your history, fact I always read your captions @ instagram and recipes. First time reading your blog . I love this post, and hope the year picks up for you! You mentioned an egg yolk in the description but not the ingredients…I will go read again. Thanks for sharing your family stories. I can’t wait to see the recipes you have in store for us. I really enjoy your recipes and have made several. I do believe that you are an astonishing cook and baker. Keep up the good work and do know that things will work out, even if you must do something else for a short while as you never know that may open a new door or opportunity. I’m rooting for you and I wish I could have had one of Rose’s burgers. I have had Meseeo’s Rosi’s Burger and it was delicious! 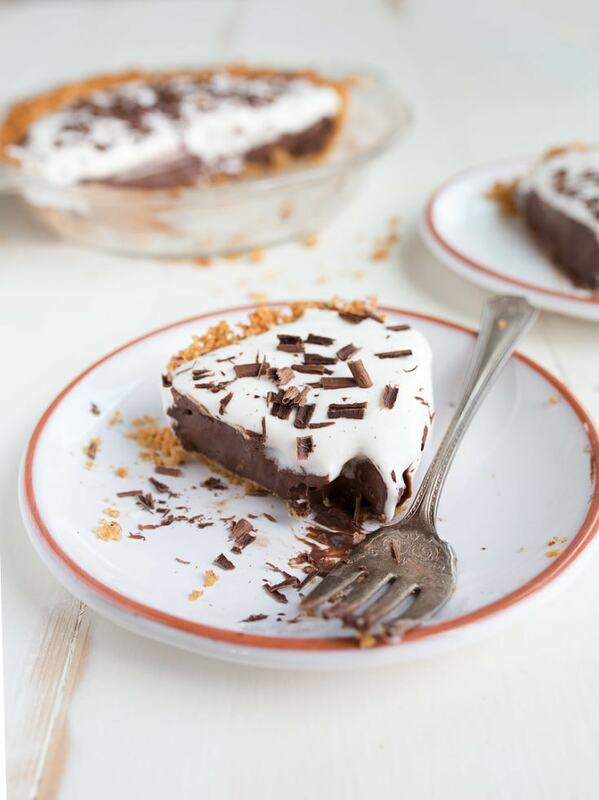 I plan to make your pie this weekend, I love chocolate pie! I really enjoy your recipes and have made several. I do believe that you are an astonishing cook and baker. Keep up the good work and do know that things will work out, even if you must do something else for a short while as you never know that may open a new door or opportunity. I’m rooting for you and I wish I could have had one of Rose’s burgers. I have had Meseeo’s Rosi’s Burger and it was delicious! 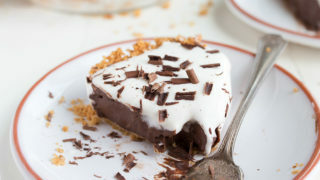 I plan to make your pie this weekend, I love chocolate pie! Continue the good work and I love your feed/website! So good, hopefully I can find the 6inch pan. I’m soexcited to make it. Thank you for sharing. This touches me.. you are an honest writer, and I am just a vegan who loves your insta for desert ideas (I don’t know why, but some deserts enrage me too) and get inspired by your creations, also my baby girls are super old, 22 and 17, and you have a darling baby.. as an insta friend, I think you are on the right track, figuring out how all of this works for you, as a yoga teacher I want to remind you that rest is always appropriate!! Whatever doubts you are having, you a putting beauty out in the world, this makes you a light bringer, so keep on keeping on, and if you are ever back in the wine country I’ll take you to the best avocado toast????????.. Love you, lady! Thanks for stopping by <3 Miss you! You’re amazing. Your posts and smiles make me smile and laugh. I love your Insta stories and just how authentic you are in your writing. You should be so proud of that. I always giggle a little when you cuss and appreciate your vulnerability. The first recipe of yours I made was the loaf pan cheesecake. I won my boyfriend and his family’s heart with it. So thank you from both of us. :) 2018 has been rough! Hang in there. One day, one hour at a time. You’re gonna get through it and one day when you’re ready to share your story, it’ll hit someone right in the heart and be the encouragement they need to get through it too. You don’t know how bad I needed to read this post right now. I absolutely adore you and your authenticity. Thank you for being you and sharing your life/love of cooking with us.???? Love this post Christina! Sending lots of good vibes your way! Love your blog and the stories and your recipes! Can’t wait to try this! Love your recipes. Small batch is everything! It’s not just you, 2018 is challenging. Truly, not the best for me. Looking fowRd to making this pie. Your post really moved me and I want you to be all right! I’ve been reading your blog and trying your recipes for more than 2 years now here in France, and it changed my life: I love dessert but my partner doesn’t, and when I found out about your site, I had an epiphany. I immediately ordered mini pie pans and actually dreamt about small-batch dessert that night. In these 2 years, you’ve inspired me to start scaling down other recipes, and I’ve been cooking more and more as a way to take care of myself and to regain balance in my life. Cooking for other people is an act of love, and so is cooking for oneself! But it’s not just your recipes: I love your words as much as the desserts you give us. So thank YOU Christina ! What is it with Texas women and chocolate pie?? 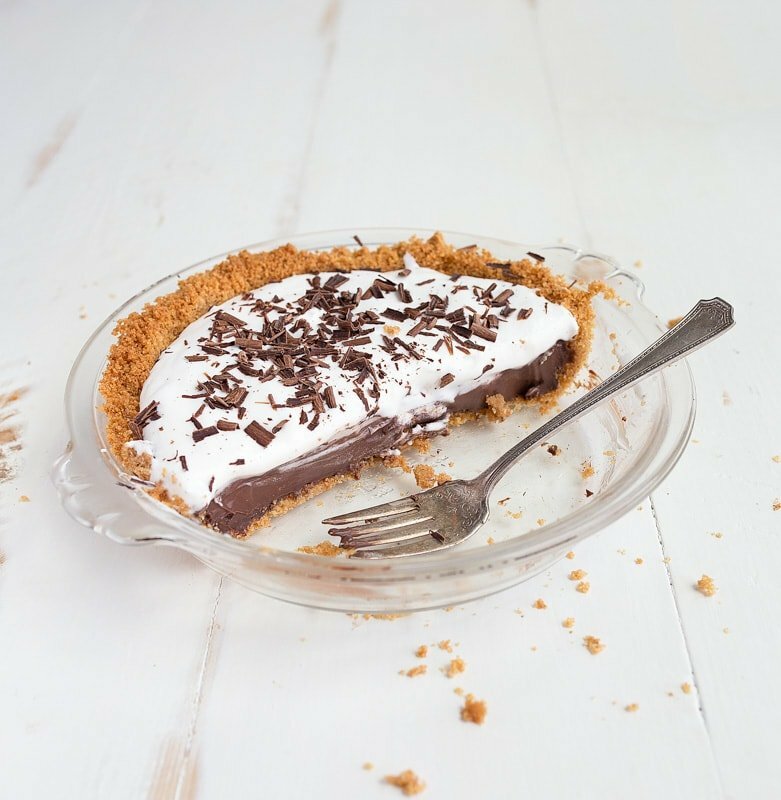 The first recipe I ever learned to make was my great great grandma Ruby’s chocolate angel kiss pie and since it’s just me in college, this is the perfect way to not make an entire chocolate pie but still have a slice (literally) of family. I might try to swap the whipped cream for a meringue with the extra egg white so it gets the angel kisses ;-) Thanks so so much for sharing your story and this recipe!! I have come to learn that was much as we want things to turn out, in the end you need to find joy in the smallest things that happen everyday. I started having the hardest day yesterday but in the evening some really good thing came across my way and this it what made the day count for me. It’s all about find the good persepctive of things I guess though it gets pretty hard most of the time. And this is me talking the “why do things in life need to be so hard to get?” kinda of person… this is the sentence that rounds my head most of the time. But then again something real good happens that makes me realize that after the heard stuff some good can come across my way. Anyway, as I said, I see myself reflected in your words… so much. 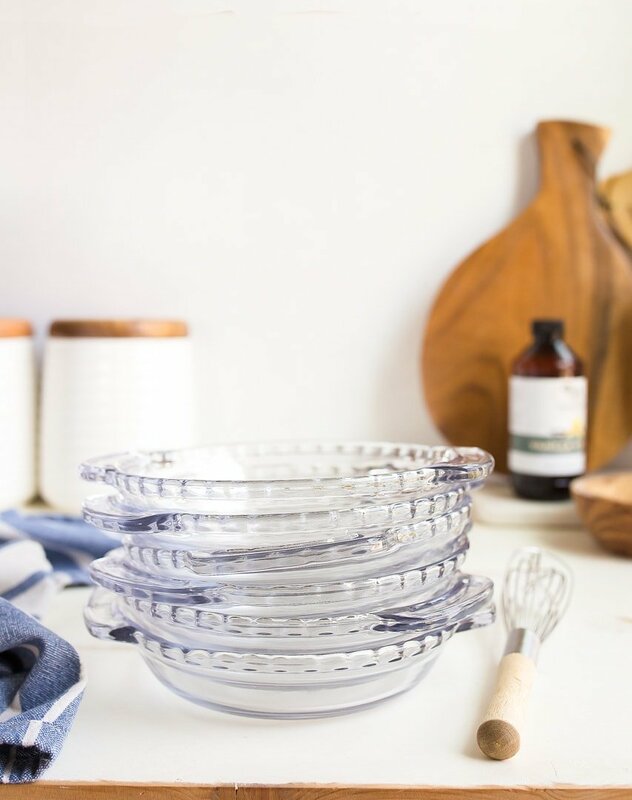 I love seeing your recipes and see that I’m not the only crazy woman who loves ramekins on top of any other serving or baking dish you can find in a kitchen! Lots of love and lots of chocolate cream pies!! Love you, your family and your page! Please know we are all so grateful to you and all the hard work you put into these recipes. I follow your Instagram daily, and look forward to seeing your posts. Thank you for sharing your life with us! I grew up with a fairly large family and learned to cook for crowds. But there’s just the two of us and this site has been a lifesaver. Baking dessert and having to eat the same dessert all week is frustrating. Finding your site has been so very helpful. It took a while to learn to cook meals for just too people but I was having a problem with desserts for two. Thank you. I started reading your blog because I love dessert so much that I want it every day and you convinced me that I could! But the real reason I continue to read is because you feel like a friend. I’ll be making your chocolate cream pie this weekend and sending friendly thoughts your way. Even though I don’t know what you’re going through, I know you have the smarts, grace and drive to push past this. I hate to hear that your having a rough 1st half of the year. I have been reading your blog for a while and I always appreciate the heart and dedication that it must take to run your own business. I can’t say I could handle it. I love the story about how your 1st post came to be and love that you are living where you feel most like yourself. My husband and I are in the process of making that happen. Thank you for continually being a bright spot in my day. I love reading your blog and always look forward to reading what you have to say, especially when it’s as heartfelt as today’s post. Thanks for always being so genuine, it is so appreciated! I’m just glad to know I’m not the only crazy person making new recipes for company. Half the time I’m a nervous wreck and almost in tears because I’m not 100% sure how things are going to turn out. They almost always do, but I don’t know why I torture myself so. You have a very amazing talent and gift and you really know how to use your food and your words to help inspire people to get in the kitchen and be covered in flour from head to toe and not give a damn what anybody thinks about it. Please keep doing what you do, but if you don’t feel like you can keep doing this blog thing, just know that there are some of us who would just be happy to have you as an Instagram friend share pictures of whatever you’re making for dinner, your dogs, your little girl, and all your travels. ❤???? I’ve never visited your site before but I’ll be back. I so enjoyed this post, even though it is bittersweet. I don’t understand the phenomenon of making small desserts or half pies because hello, what’s better than pie for breakfast! However, I did receive a set of four tiny cast iron skillets for Christmas from my mother. I think they might be 2.5 inches? So, I’m looking for miniature cake and cookie recipes. Thank you! Good luck with the momming. I have a son, who is 15 and going through driver’s ed and girl stuff. It doesn’t get any easier but it does get more fun, I think anyway. This pie looks delicious and I will be making it! Whenever I want to bake something, I usually come to your site to see what I can make because they always turn out well. It’s so refreshing to see someone show us all sides of your life. So many bloggers look perfect and seem like they have it altogether and take the perfect pictures and never have a down day. It’s so nice to see someone real. This year has been very tough for me too. Some days you just have to feel all the feelings and let them pass on their own time. And some days you’ve just got to do something nice for yourself or bake something sweet! Thank you for being real! My grandmother always added an egg yolk and a little extra sugar to boxed pudding when she made pie. She died many years ago and I still miss her. Thank you for the fond memory. I hope your year gets better. Thanks so much for your dedication to small batch recipes. My husband had a heart attack recently and you have become my go to site. We are now a low sodium low fat house but still like a little something sweet. Being able to make something that only serves 2 keeps us accountable. Keep up the great work. I’m so glad I found your site. I can’t imagine all the hard work that goes into running the blog & creating the recipes. I have since bought two of your cookbooks and have never been disappointed with a recipe. So thank you for doing what you do!!! My latest binge is your Microwave Lemon Curd. I think I have made it 4 times now. Sooo good. And so easy. I hope the remainder of 2018 brings you good health, happiness and lots of smiles. I am sorry your year is not going the way you intended. However, I appreciate all of the work you put into your recipes. I got married almost 3 years ago, and I really struggled with cooking for just two of us. My mom always had full course meals on the table each evening after working full time, and I struggle to get spaghetti with jarred sauce on the table. I’ve lost my love of cooking, but your simple recipes with common ingredients, and sized just right for the work people, bring me some sanity. Your job and your passion may not be where you want them right now, but please don’t forget about all of the people you positively influence through your work. You are an inspiration, and you are appreciated, just the way you and YOUR unique blog are. Don’t forget that! Until I discovered Deserts for Two, I had no idea that small pie and cake pans existed.. I’d never owned a ramekin..
My wife and I love desserts. Desserts which we don’t have to eat 4 days in a row. Until you, that’s pretty much what we had to do. Cakes for two.. Pies for two.. Bread pudding for two.. Etc., etc.. Dessert Heaven.. I am so sorry that your year hasn’t been as spectacular as you wished and, in my opinion, deserve..
Take heart in knowing that so many people, like us, feel privileged to have discovered you and your wonderful Desserts for Two..
First, I have to saw how much I have enjoyed your blog post and recipes ever since I discovered you well over three years ago. I have all three of your cookbooks and go back to favorites from the books and your blog over and over. I have recommended your blog to so many friends and do hope you continue to occupy a space here on the the Internet. It saddens me to read that the year has been a difficult one but it seems you are happy you are back in Texas so maybe this move will redirect the year down a more positive road . I know I speak fpr so many readers when I say you are a cooking and baking inspiration and bring so much deliciousness to all who visit here. I am sending poaitive thought your way.. The start of a new year is never what you expect it to be. You have to have faith and be hopeful that everything will work out. Do what you do best and hang in there. Thanks so much for your beautiful post full of honesty and heart, Christina. I actually have tears in my eyes. I know how you feel because I’ve suffered two horrible losses in my life, one this year and one in 2016. I hope your year gets better for you. I discovered your first book because no one in my family likes dessert (!) so I found myself baking only for myself. I started with your tres leches cake, which was amazing! Now I’ve been an avid reader of your blog and have all three of your books. I definitely want to make this delicious pie. Thank you so much for what you do for us. It means a lot for those of us who want dessert in small quantities. You are amazing! And I hope you get through this difficult time and find a way to keep on doing what you do so well. In fact, I believe you will get through it because you have more positive energy that the law allows! A great blog site and 3 terrific cookbooks PUBLISHED with amzing photos of your own. And I believe you are still in you early 30s. Lots of good things are ahead for you (and for us, your fortunate audience). Wishing you all the courage and strength to find your way. ???? I love your recipe,it is easy to prepare. Besides flavor, is there any special reason you like to add cinnamon to the graham cracker crust? I wasn’t if you felt like it brought out the flavor better (like coffee does to chocolate)? Thanks. I could really use a picture or something of what 4 graham cracker sheets looks like (mine don’t come in sheets? – and I’m sure some others might be using crumb from a box) About how much crumb does ‘4 sheets’ make? I’m not a great one for prayer… but after reading what you’re feeling (or were feeling in May…) about your year, I’m going to dedicate something (prayer or study) just for your feeling better about things. Yes, you have that effect.